Whether you're putting together a resume, flyer, or web page, everyone needs to find and compare fonts some time. 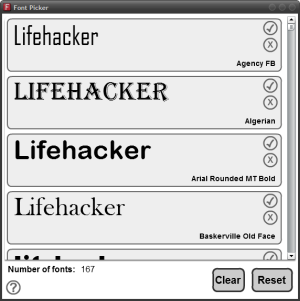 Here are some tools that can help you find the perfect font. In all we're looking at a slate of excellent tools you can use to organise your fonts and identify and compare them; then we'll take a quick look at some great resources for downloading new fonts; and finally, we'll show you how you can make your own font, pixel-by-pixel or from your own handwriting. Every operating system comes with a built-in font viewer and installer, but sometimes the out-of-the-box options don't cut it for serious font work. 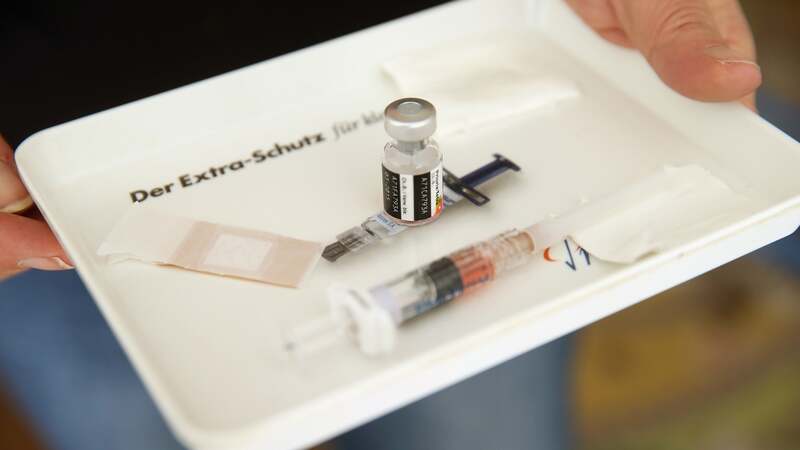 Take a look at a few alternatives. All platforms with Adobe AIR: Test out words in any font already installed on your system using the free Font Picker application (original post). Enter the text you want to preview and scroll down the list of available fonts, and clear away the ones you don't want using the X to narrow down your list of choices and compare the finalists in a single window. Windows only: Organise, preview, categorize, and install fonts on your PC with the free AMP Font Viewer application (our original review). 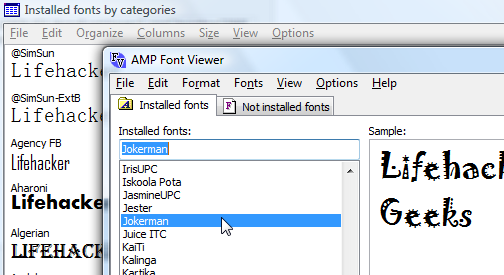 Particularly useful after you feast on the free font downloads listed below, Amp Font Viewer can categorise fonts and even install certain types for a single session, or save uninstalled fonts into a particular folder for archiving and backup. Windows users in search of the perfect font manager should also check out Cfont Pro (our original post). Mac users, OS X's built-in Font Book is pretty good for managing fonts, but don't forget you can also use Quick Look to preview fonts. Linux users, check out Fonty Python (our original post). Stealing is the sincerest form of flattery, so when you see a killer font and think, "I want that!" you also want to hit up one of these tools. When you're dying to know what hot font that web site or magazine is using, upload a digital image to the amazing WhatTheFont webapp, a font-identifying system. If the font you're trying to ID appears in an image on a web site (like a header), just enter the URL of the image and let WhatTheFont do its magic. If you're looking to do some font identification on the go, you may also want to the WhatTheFont for iPhone. 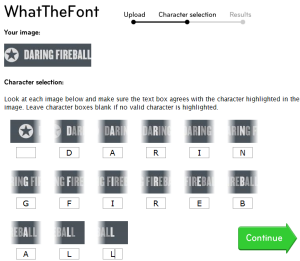 You'll have to help WhatTheFont identify what letters are what in the image, and its results will include a few similar options to choose from. Keep in mind WhatTheFont won't work for custom typography (like in Lifehacker's header). 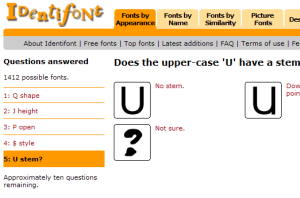 To find a font from memory, try out Identifont, a simple webapp that asks a series of questions about the font you want and narrows down the field to options that match your description. You can also enter a known font name and get similar fonts, or a font designer or publisher to get the fonts they've created. Designer types trying to ID fonts from memory who notice things like whether it's monospaced or serif should check out TypeNavigator webapp. 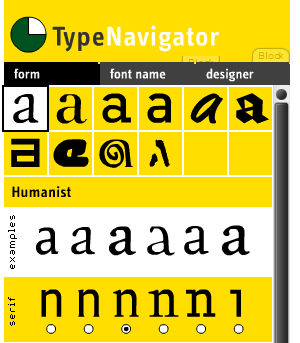 Start by choosing the font form, name, or designer, then check off various attributes of the font down the line in the left sidebar, and TypeNavigator will display fonts that match on the right side. 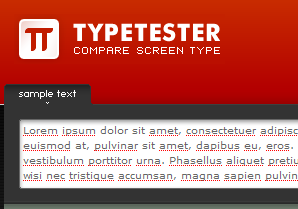 Web page makers (or bloggers tweaking their CSS) should check out Typetester, a web-based screen font previewer. Enter your sample text into Typetester, and try out up to three different fonts (separated into web "safe" and otherwise), at different sizes and styles side-by-side. When you've got the family, size, and style you want to use on your web page, Typetester will spit out the CSS you need to hook it up on your page. 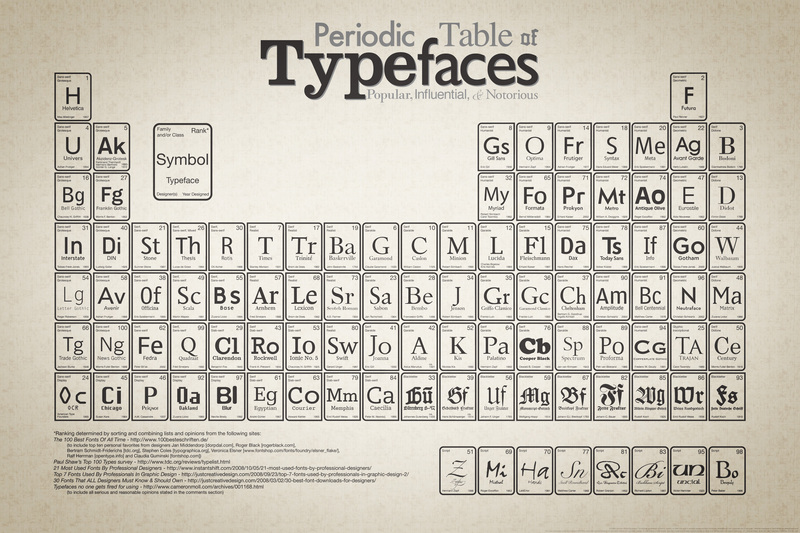 If you're working on an ongoing project that requires choosing fonts—or you just want to get more familiar with typography—consider printing out this nifty "Periodic Table of Typefaces" for your office wall (original post). There are countless places online to both purchase fonts or download them for free. Here are a few good sources for font freebies. Dafont—One of our favourites, preview fonts live online and download the ones you like. Font Squirrel—"Free fonts for graphic designers, all with commercial-use licenses." TypeNow.net's Themed Fonts—Free fonts from TV shows, movies, and brands you love, from Alias to Xerox. Fonts 500—"The web's top 500 fonts of all time," free to download one by one, or get all 500 for under 3 bucks. SearchFreeFonts.com—A user-rated directory of free fonts organized by category and rating. 1001 Free Fonts—Offers separate Windows and Mac versions with online preview and licence information. Finally, if someone else's font doesn't cut it for you, there are a few ways to make your own. Turn your handwriting into a font: with YourFonts (free, our original post), or Fontifier ($US9). Design your font pixel by pixel: If your chicken scratch won't make a good font, you can design a custom font online with the easy FontStruct (our original post). While it's not a pro tool, FontStruct lets you draw your font pixel-by-pixel in your web browser and download the results. Do the whole alphabet or a single letter, and browse the typographical creations others have created there. What's your favourite font or typography tool? Let us know in the comments. Gina Trapani, Lifehacker's founding editor, could spend all day playing with fonts. 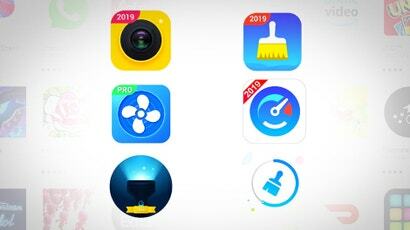 Her feature Smarterware appears every week on Lifehacker. Can anyone else not see the contents of this article? I've looked from two different Intertnet connections and both Firefox and IE. Sorry guys, working to get this fixed right now.